OfficeMax and Office Depot just announced a merger. But even combining forces won’t be enough to overtake competitor Staples, Matt Townsend at Bloomberg News reported. Staples holds a 35 per cent market share of the office supply business, while Office Depot has 26.1 and Office Max has 15.6, according to IBISWorld. 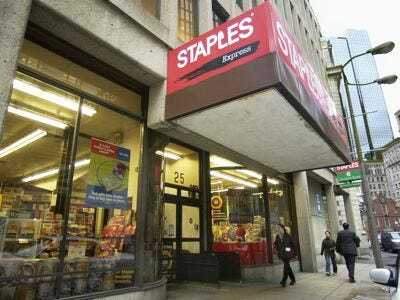 Even after the merger, Staples has $24 billion in sales, which OfficeMax and Office Depot have a combined $18 billion. There’s a simple reason why Staples has been able to eclipse OfficeMax and Office Depot. Staples focuses on government and business contracts, which makes up $10.1 billion of its sales, compared with $9.6 billion in stores, Bloomberg reported. Staples could stand to benefit because it could win even more business contracts as Office Depot and OfficeMax go through the merger. Staples also has the opportunity to take new market share: Office Depot and OfficeMax will close a combined 600 stores, leaving space for the larger retailer to take over, Kevin Kingsbury at The Wall Street Journal reported. “While it makes sense on paper, the obstacles to (the merger’s) success are dramatic,” The WSJ noted, citing Janney.